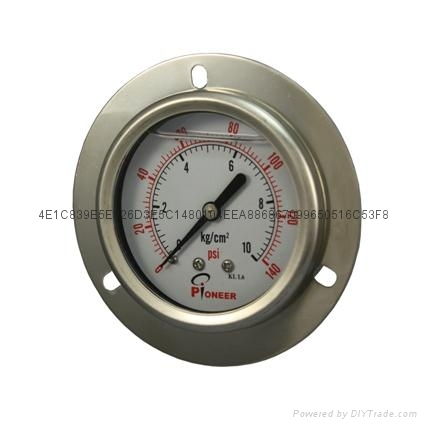 All stainless steel pressure gauge is suitable for the corrosive strong suited for stainless steel components of medium and severe external corrosion environment. 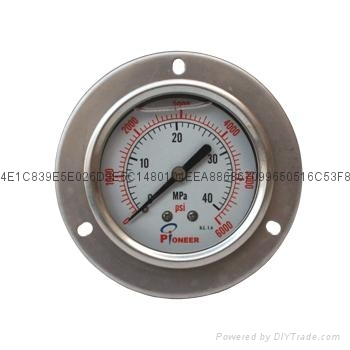 All stainless steel seismic is refers to the internal injection liquid in the casing pressure gauge pressure gauges, to prevent the pressure gauge is too force fluctuations or external earthquake equipment to measure the impact of pressure forces, the earthquake and environmental vibrations have obvious buffering effect. 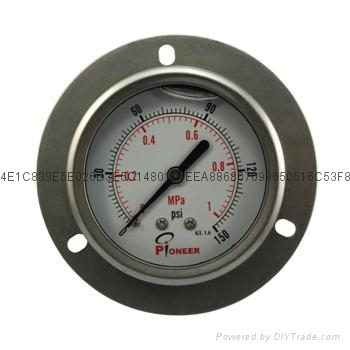 Through to the oil filled in the table, also parts of the machine also have do with lubrication, and extend the service life of the instrument. 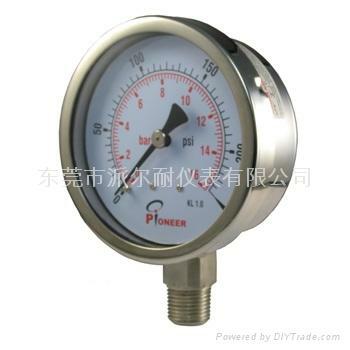 It is the most commonly used hydraulic station, hydraulic machinery, sometimes used for industrial pump, if the pressure fluctuation is too big, can choose to add damping the self-contained nail, or add buffer bend at the bottom of the pressure gauge. 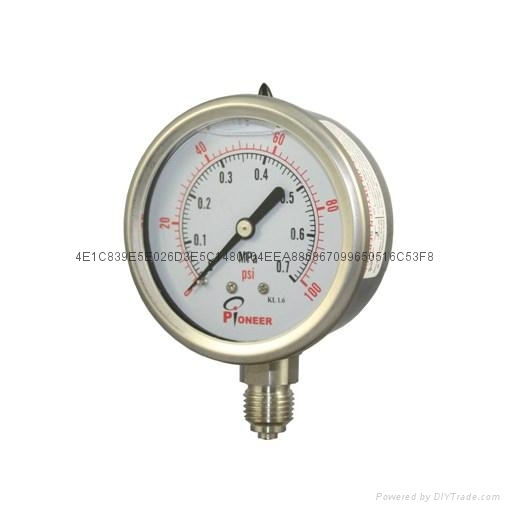 Due to the difference of the material of stainless steel pressure gauge is tie-in, can adapt to a variety of special work for place and apply all kinds of medium, when necessary can also and acid and alkali resistant coating is tie-in, composition such as stainless steel is four fluorine material, solve the problems on the compressive strength test for you! 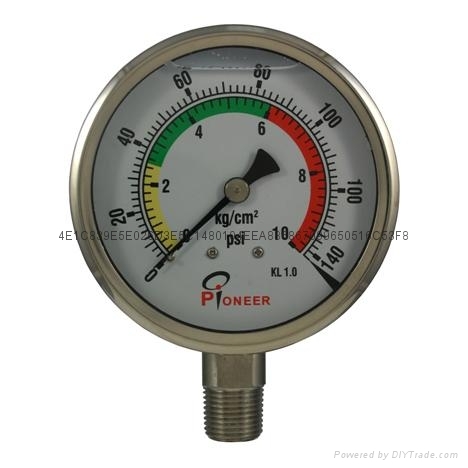 All stainless steel pressure gauge with its wide application field and good compatibility and unparalleled performance is widely used in petroleum, chemical, chemical fiber, metallurgy, power stations and other industrial departments have corrosion resistance, high resistance to vibration requirement of technological process of measuring the pressure of all kinds of fluid and gas medium. 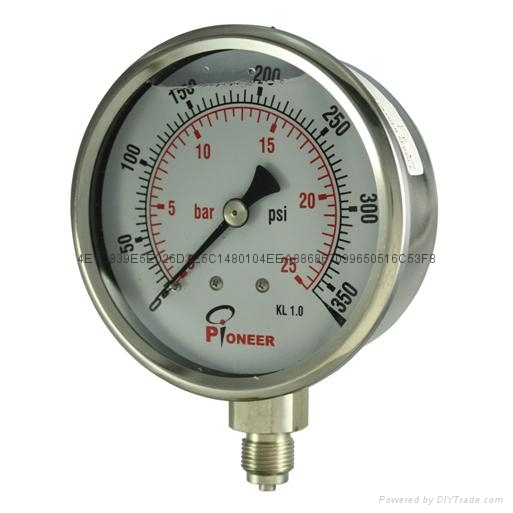 PIONEER all stainless steel pressure gauge has the reasonable structure design, exquisite appearance, exquisite workmanship, has high measuring accuracy and lasting stability, thus not only can provide export, especially domestic user to introduce the foreign advanced technology and equipment of similar instrument to realize the localization of ideal accessory products. (1) the appearance is bright and durable. 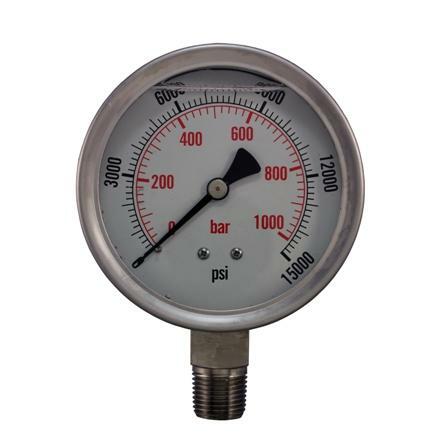 (2) the measurement range is wide, and there is excellent corrosion resistance of acid and alkali. 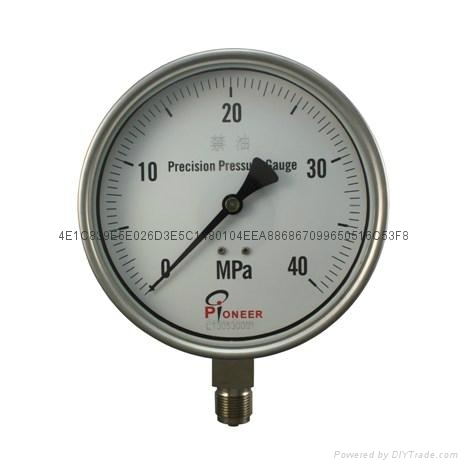 (3) with high quality components and exquisite technology, it has high measurement accuracy and lasting stability. (4) the price is reasonable and the delivery is fast and fast. (5) the product has one year warranty period, and the warranty period is free for maintenance or replacement of quality problems. 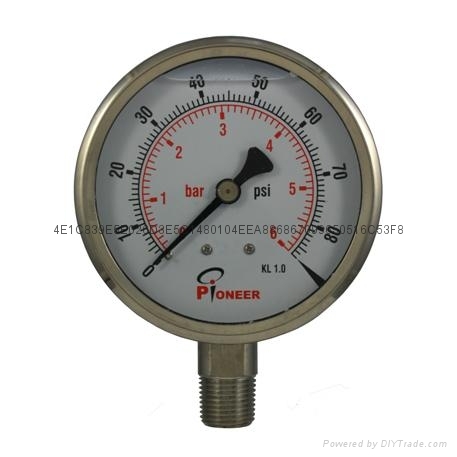 (6) we have perfect after-sales service.